Home / 2D animation / articles / CP / Independent animation / Web & Independent Animation / web animation / web animation watch / Web Animation Watch: Totally Out Of Tune, Simon's Cat and more.. Web Animation Watch: Totally Out Of Tune, Simon's Cat and more..
Something a bit different to start off this week. Jonti Picking's Weebl's Stuff has been pumping out quality web animation for over a decade now. In fact, you could say that the site, and more recently their Youtube Channel has pretty much defined the web animation scene. 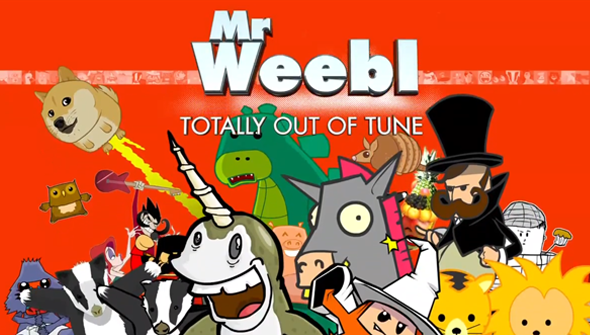 Now for the first time, you can buy a digital compilation of their Greatest Hits in the form of Mr Weebl: Totally Out Of Tune. It features 62 minutes of favourites such as Badger Badger Badger, Magical Trevor and Amazing Horse, remastered in glorious widescreen-o-vision. Available on iTunes, Mondo and Google Play. Our favourite feline is back in a new Halloween flavoured short from Simon's Cat. We really don't need to say any more by now do we? You know it'll be a treat! New from our pals at Mashed, the much anticipated Alien Isolation videogame is (appropriately enough) mashed-up with some rather unexpected other alien critters. WARNING: may scar Toy Story fans for life. It's not so often stop-motion features in WAW. So we're always keen to see stuff like this awesome Kaiju Claymation Fight: Godzilla vs Anguirus. From Fred the Dinosaur Man.